This review is based on the collective notes from a Baltimore American Whiskey Club (BAWC) tasting conducted on March 7th, 2015. Attending members were Josh Sullivan, PJ Sullivan, Nicole Fisher, Owen Lang, Justin Custer, Devin Byrnes & Steven Silberg. Written by PJ Sullivan. If you’re like us, you’ve probably wondered what’s the best bargain when selecting a bourbon that won’t break the bank. Well, we decided to put that query to the test. 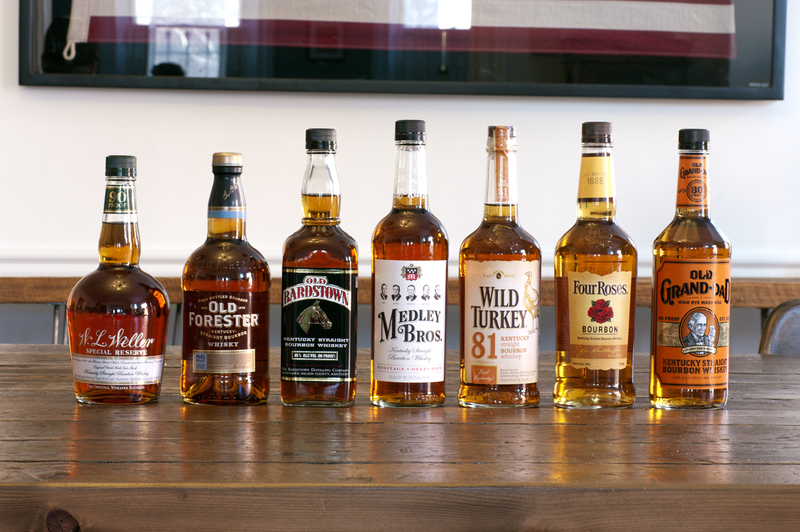 We selected seven bourbons that were all purchased for under $25 and blind taste tested them. The results were quite informative. Some results were predictable. Some were eye-opening. After we tasted and took notes (see below) on all seven brands we ranked them and then put the top 3 to a test in a Manhattan. This was a challenging tasting as the bourbons’ characteristics were much more muted than our usual tastings. However, there was a clear top tier that included three bourbons, W.L. Weller, Old Forrester and Medley Brothers. These three bourbons were head and shoulders above the rest. They had distinctly pleasing flavor profiles. While there wasn’t a consensus on where the three bourbons fell among each other it was evident that Old Forester was the best value as it’s almost $10 cheaper than Medley Brothers and W.L. Weller. Since these are cheaper bourbons we wanted to see which of the three made the best cocktail. 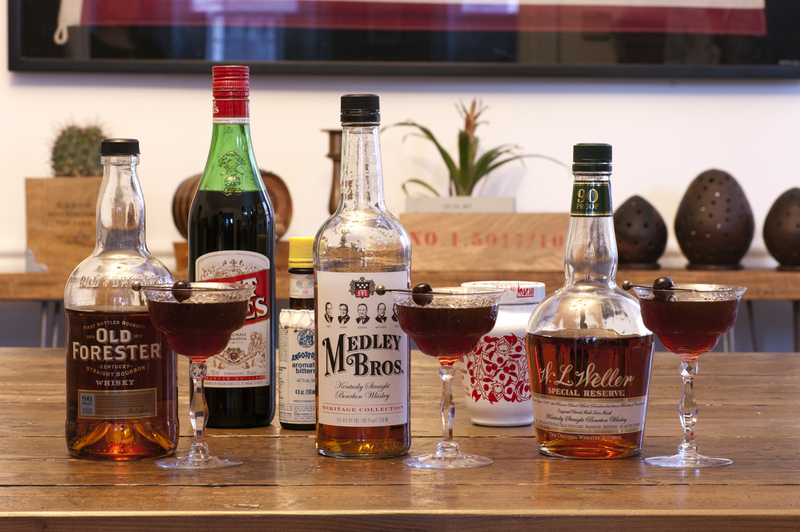 In this case, we stirred up some Manhattans. All three were solid, but we all agreed the W.L. Weller Manhattan was the best. It’s unique characteristics, such as the eucalyptus and herbal qualities, worked best with the vermouth and bitters. Old Forester got lost in the cocktail and the Medley Brothers was a little on the sweet side. Overview: This was the surprise of the group. We didn’t expect to rate this guy as high as we did. Old Forester starts off with a distinct whiff of apple, which carries into the palate. In the mid-palate you’ll notice the tannins creeping in. The finish is very dry, which is pleasing considering a lot of lower price point bourbons lean on the sweet corn notes. Overview: Weller has the most distinct flavors of all the bargain bourbons, which is why it was a crowd pleaser. The eucalyptus and honey lemon drop nose is so soothing. The palate has a dry, menthol and herbal play that piques interest. The finish is also on the dryer side. It’s definitely a lighter bourbon. Great for summer nights on the porch. Overview: Medley Bros. had the best nose of the bunch. It had some of the notes you’ll start to see in higher price point bourbons like nuts and toffee. The palate wasn’t quite as pleasing as Weller but had nice standout flavors like light fruit. It was one of the only bargain bourbons to have a hint of oak in the finish. Overview: Wild Turkey was the best of the lower tier. These bourbons really didn’t have much going on, but Wild Turkey didn’t have as many negatives. Vanilla carried through the experience. Overview: Four Roses has a distinct powdered sugar note that starts in the nose and carries into the mid-palete. The palate has some vegetal and apple notes that are nice, but we were also picking up a decent amount of unpleasing plastic flavors. The finish was lacking also. Overview: Old Bardstown let us down… we expected it to come in higher since we all love its higher proof brother. The nose wasn’t very nice and the palate didn’t help it out much. The finish was fleeting and had no noteworthy characteristics. Overview: We don’t recommend anyone buy Old Granddad 80. It wasn’t good at all. It tasted like it went bad. Great review. How about a taste comparison between 80proof vs 100 or 101proof Bourbons? Does the higher proof add or detract from the taste? No quiosetn this is the place to get this info, thanks y’all. Eh, well, i don’t know about that. Four roses is pretty good.